The American Automobile Association predicts that there are going to be 34.9 million people traveling July 4th weekend, up 17% from last year. About 90% of them will be driving, AAA says. The AAA doesn't appear to have any statistics about how many of them will be dragging or driving a recreational vehicle, but when you are out there on a holiday weekend, you'd swear that at least a third of the folks on the road are swinging and swaying along with their housing in tow. In fact, the Recreational Vehicle Industry Association reports that more than 8.2 million U.S. households own an RV. 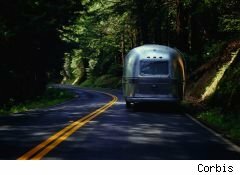 Of those, 45.4% expect to travel more often in their RV this summer than they did last year; 41.9% say they'll be traveling the same amount. Why do so many people like traveling with a hotel on wheels? According to the association survey, almost 82% of RV owners say they save anywhere from 15% to 75% by traveling in their RVs. Likewise, PKF Consulting, a hospitality consultancy, found that family RV trips are, on average, 27% to 61% less expensive than other types of vacations. If you're not sure whether owning a recreational vehicle is for you, renting is the best way to test things out. Several years ago, my husband and I rented a 28-foot RV and drove it to the Indianapolis 500. We had a good time, but we discovered that not having a separate vehicle to get around was a pain in the neck. So when we decided to buy, we picked a travel trailer that disconnects from our truck, so we can go anywhere we want without having to pack up and move everything. After owning that for four years, we've concluded that the unit is too small and not laid out very well, so we're contemplating replacing it with something slightly longer and equipped with slide-outs. Perhaps, if we had rented longer before we bought, we would have realized all these things and wouldn't have to be replacing the trailer so quickly. There are no big tricks to renting, but I do have a couple of suggestions for people who are as green as we were when we first explored the market. Calculate the rental cost carefully. Not everybody charges the same amount and some dealers tack on a long string of extras that can drive the price up. At the very least, figure out the daily rental and the mileage rate and estimate the total before you commit. Bring your own bedding and kitchen supplies. The prepackaged kits the dealers offer for a fee are usually no bargain. Do a test drive. There's a big difference between a 22-footer and a 32-footer and smaller is always easier. Learning to drive a big rig isn't rocket science, but if you spend the whole weekend too terrified to go the speed limit, you may be miserable. Insist that the dealer take plenty of time to teach you the basics. Knowing how to fill the water tank and empty the waste tank are important. And if you've rented a trailer, mastering the hook-up and the release are vital. Also, being able to level the unit will make you more comfortable. Insurance is necessary. Make sure you'll be covered by your own insurance or you buy a policy from the dealer.